The process on inserting the SIM Card (mini SIM type), installing the microSD Memory Card, assemble the battery on this Galaxy S Plus almost similar with Samsung Galaxy S III. Almost means it's not exactly the same. 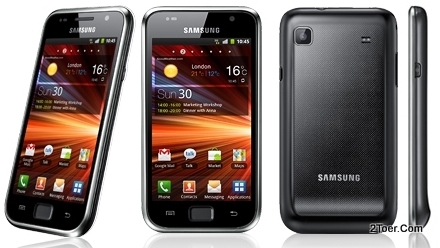 It might because this is version is a kind of first generation of Galaxy S series. 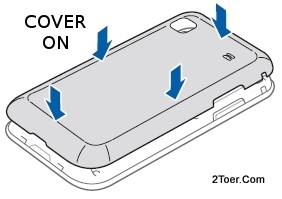 Facing downward your phone and make sure the rear panel where the cover locate can be clearly seen. On the bottom side of the phone, there is a gap that has a function as opening point. Insert your fingernail into the gap, then pull it upward until the cover half removed. Continue on opening the cover casing by using your fingernails on the sides (left, right, top) until the cover finally opens and detaches from the body of the Galaxy S Plus. Three important parts after you've opened the back cover: empty battery compartment, SIM card slot, and microSD memory card slot. The memory card slot located directly under the 5MP camera, and from the sim card slot is on the right side of the microSD slot. That's means, the SIM slot on the top-right of the battery compartment, and the memory slot on the left-top of the compartment. See the image to ensure what we talking about. Bring your SIM card of your favorite mobile provider (carrier), make sure the cut-corner of the SIM is in outside position (pictured); make sure that the gold-contacts of the SIM card facing downward. Then align the SIM with the slot, and using your fingertip, slide the SIM into its slot. Whenever your fingertip can't be used to slide the SIM card, push the SIM card with your fingernail until the SIM reaches the end of the slot. By factory package default, the battery of Samsung Galaxy S Plus isn't yet assembled. That's why you need to install the battery manually. After you open the cover, grab the battery with your hand, then make sure the LOGO facing upward, align between metal connector of the battery and the compartment, then slide and press the battery to the compartment. For microSD card, you can insert the microSD card on memory card slot with the same steps like the way you insert the SIM card. Make sure the memory card align with its slot (Do not mistake with SIM card slot), then with gold-colored contacts facing down, push the memory card onto the slot until it perfectly locks on the slot. There is an easy way to make sure the card have locked on its slot: If the card didn't eject that means you are success on inserting it. If you want to remove the memory card from its slot. Unmount it first via Settings > SD card and phone storage > Unmount SD card. After that, do not force to pull out the microSD card. You need to unlock it first. Push gently again the slot, then make it a little pop out. That means the card is unlocked, then you can easily grab and slide the card out from its slot. You can use the microSD card capacity up to 32GB. Larger than that wouldn't be read. Press and hold the power button for about 10 seconds would give your device force to restart aka reboot. This action can be a temporary solution in case your phone suddenly hang or the touchscreen suddenly didn't respond to any touch (freeze). But in case the story of hang and unresponsive as a habitual problem, you need to resolve this issue by performing Hard / Master / Factory Reset. This Factory Reset can be a solution in case you wanna erase all the data on your Galaxy S Plus (videos, photos, google account, document, musics, etc) and make the phone back to original factory default settings. This usually take place whenever you wanna resell your phone or give it to other person.